I am amazed how many people I meet in the corporate world who have absolutely nothing they feel passionate about. Their life consists of getting up, picking up a quick breakfast on their way to work, be at work, eat lunch at their desk, go home, cook/eat dinner, watch TV, go to bed. Repeat day after day, week after week, month after month, year after year. If they actually do have time on the weekend, they don’t know what to do with themselves. They wait for Monday morning to start that rat race all over again. I want you to be different and that’s why I encourage you to start writing an “energy list”. An energy list should be your personal list with all the things that you could do that give you positive energy when things don’t go as planned. This list will also help you to reduce your levels of stress. An “energy list” is a specific mental strategy and an awesome way to explore what makes you feel good. If you don’t know, take the time to explore what you like doing. We are all different and we all enjoy different things. Life is is short and it is meant to be lived with joy and passion. It is all about dreaming more, doing more and becoming more. We should be excited about every single day in our life. 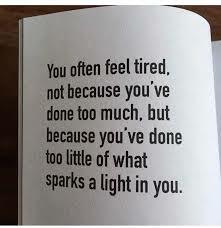 Find what sparks a light within you, and be that spark for others.